The NSW Government’s policy on the use of native forest biomaterial for electricity generation is implemented through the Protection of the Environment Operations (General) Regulation 2009, specifically clauses 96-98. As a result of land management and biodiversity reforms, some changes have occurred in the terminology, legislation and instruments that apply to native forestry. In those instances, any references to revoked legislation are now taken to be references to the amended legislation and instruments. Clauses in the Protection of the Environment Operations (General) Regulation 2009 prohibit the use of native forest biomaterials in electricity generation, but exempt certain types of native vegetation or woody waste from the definition of native forest biomaterials. Only these types of bio-materials can be burned for the purpose of electricity generation. certain native forestry materials resulting from forestry operations carried out on land to which an Integrated Forestry Operations Approval (IFOA) or Private Native Forestry plan and Code of Practice applies. The questions and answers provide additional information on these exemptions. For further information relevant to private land see the Local Land Services website. Clause 98 of the Regulation requires the occupier of any premises on which biomaterial of any kind (including non-native bio-material) is burnt in any electricity-generating work to keep certain records in accordance with any guidelines established by the EPA. 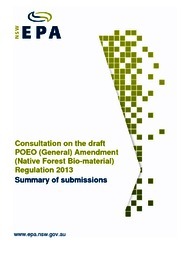 The Guidelines for the Burning of Bio-material: Record-keeping Requirements for Electricity Generating Facilities (PDF 77KB) were updated by the EPA and gazetted on 14 March 2014. The record-keeping guidelines apply to all electricity-generating works. The EPA is the appropriate regulatory authority for the purposes of clause 98 of the Regulation and is responsible for ensuring that all electricity-generating works which burn biomaterial comply with the record keeping requirements. Records must be kept for four years. Volume of high quality products sold by State Forest (sawlog, poles, piles, girders and veneer). Volume of lower quality solid wood products sold by State Forest (sawlogs). Volume of pulpwood sold by State Forest (export and domestic). Volume sold of other timber products by State Forest (firewood, fencing, wood-chop blocks, etc.). Volume sold of biomass for domestic electricity production by State Forest. Area harvested for regeneration purposes by State Forest. Area harvested using Australian Group Selection (AGS) by State Forest. Area harvested for select products (selecting single trees) by State Forest. Area harvested to promote growth on residual trees (thinning) by State Forest. The EPA will conduct regular audits of all this information. These arrangements will be formally recognised in the new Coastal IFOA.